By framing the cases at the outset in labor law terms, these statements—and other similar comments by Justices Kagan and Sotomayor—reflected those Justices’ view that labor law concerns should be dominant in the Court’s resolution of these cases. Clement and Wall each emphasized that the Supreme Court has repeatedly held—most recently in CompuCredit Corp. v. Greenwood—that the FAA’s rules for enforcing arbitration agreements can be displaced only when Congress in the text of a statute indicates its intent to preclude application of the FAA’s principles. Nothing in the NLRA mentions either litigation in court or class actions; nor does the NLRA’s text indicate any intent to displace the ordinary rules applicable to arbitration agreements. Justice Sotomayor interjected that the Court has applied that test to decide whether Congress intended to prevent a federal cause of action from being arbitrated, and instead to be actionable only in court. But the question before the Court in these three cases is how to reconcile two federal statutes; the logical way to do that is to determine whether Congress in the NLRA superseded the FAA’s general rule that arbitration agreements should be enforced according to their terms. And the text of the NLRA contains not even a hint that Congress had litigation in mind, let alone that it intended to override the general rules associated with arbitration—a result that would be particularly odd in the labor context, where arbitration is ubiquitous. That outcome does not require the Court to hold the NLRA inapplicable to litigation activity. Outside the arbitration context, without the congressional command embodied in the FAA, Section 7 could bar employer interference with concerted litigation activity by employees—just as the FAA requires the enforcement of agreements to arbitrate bilaterally, but states are free to bar waivers of class actions not included in arbitration agreements. That is exactly what the Supreme Court held in Concepcion, when it declared California’s Discover Bank rule—which invalidated as unconscionable agreements to waive class arbitration and class litigation—incompatible with the FAA when applied to arbitration agreements. NLRB General Counsel Richard Griffin defended the Board’s position. He was met by skeptical questioning from the Chief Justice and Justice Alito, both of whom joined the majority in Concepcion and Italian Colors. That inconsistent approach was highlighted when the Chief Justice asked Griffin whether the NLRA permits enforcement of an arbitral rule making collective arbitration available only for claimant groups of 51 or more. Griffin said that such a rule could not be embodied in the arbitration agreement, but would be enforceable if it were a rule of the arbitral forum selected by the agreement. That concession (which was disclaimed by Daniel Ortiz, who argued on behalf of the employees in one case) seemed to undermine the Board’s position. As Clement and Wall put it, the NLRA prevents the employer from interfering with the rules of the forum, whether judicial or arbitral, and one of the fundamental attributes of arbitration—protected by the FAA—is that it is bilateral. But, as we explained in the amicus brief (pdf) we filed on behalf of the Chamber of Commerce, the savings clause saves state contract laws of general applicability from FAA preemption; the Court determines whether another federal law displaces the FAA by applying the “contrary congressional command” test. Moreover, Concepcion held that the savings clause does not “save” rules prohibiting waivers of class procedures, because such rules interfere with the bilateral nature of arbitration and thus “create a scheme inconsistent with the FAA.” Indeed, if the NLRB were correct, a state could simply declare all arbitration agreements illegal, and then assert that in refusing to enforce the agreements it was applying the neutral, generally-applicable state law principle that “illegal” contracts are void. To avoid that result, the FAA must be taken into account in determining whether a contract is “illegal”; failing to do so would create a huge gap in the statute’s protection of arbitration. Justice Kagan tried to resuscitate the NLRB’s position by asking whether an arbitration agreement must be enforced if it provides that the employer will pay arbitration costs for male employees, but not for female employees. Wall explained that such an agreement would be unenforceable. The reason is simple: federal law outlaws such discrimination, and the application of that generally-applicable rule—whether as a matter of federal or state law—fits within the FAA’s savings clause because it does not target a fundamental attribute of arbitration. The distinction is illustrated by the Court’s decision in Concepcion, which held preempted a California state rule barring enforcement of arbitration clauses with class waivers, even though framed as part of the general state-law principle that unconscionable contracts are unenforceable. States may apply general unconscionability principles to arbitration agreements—as the Court has recognized in decisions such as Marmet Health Care Center, Inc. v. Brown—but they cannot do so in a way that interferes with arbitration’s fundamental attributes. Similarly, the FAA does not displace generally-applicable federal laws—unless such laws interfere with arbitration’s core features. For a federal law to accomplish the latter, Congress must evidence its intent to do so in the text of the statute, which it did not do in the NLRA. Griffin recognized that was permissible, but asserted that the NLRA goes further and protects the right to bring one arbitration rather than three. But Justice Kagan took a somewhat different view in her dissenting opinion in Italian Colors. There, where the issue was whether the cause of action conferred by the antitrust laws could be “effectively vindicated” without class procedures, she stated that, in her view, the arbitration agreement was unenforceable because “as applied in this case cuts off not just class arbitration, but any avenue for sharing, shifting, or shrinking necessary costs.” The “the agreement could have prohibited class arbitration without offending the effective-vindication rule if it had provided an alternative mechanism” for coordination among claimants. In other words, the arbitration agreement in her view could be enforced as long as an avenue for joint action remained open—the very point that Justice Kennedy had made. More fundamentally, the Board has already abandoned the position hypothesized by Justice Kagan during yesterday’s argument. It agrees that an individual employer can be required to arbitrate a claim, rather than sue in court, even if the claim is one for “mutual support” and therefore qualifies as concerted action under the Board’s interpretation of the NLRA. And it agrees that an employee can be required to utilize collective procedures in arbitration, rather than court. Those concessions necessarily rest on a recognition that the FAA background rules limit the scope of the “concerted action” that is protected by the NLRA (because of the absence of any express indication that Congress intended to override the FAA). And the Board advanced no principled reason why some of the FAA’s principles apply–such as the one that arbitral forums vindicate rights as effectively as judicial forums–but the principle preserving the right to bilateral arbitration does not. Clement ran out of time before he could respond, but the answer is clear: all parties are helped when legal issues are decided on the merits. That virtually never happens in class actions. As the Court itself has recognized, once a class is certified, the case is virtually always settled. Studies analyzing class actions bear this out: litigated class actions are as rare as snow in July. The judicial proceedings that precede those settlements—decisions on the motion to dismiss and class certification—do not examine the merits of the underlying claim. On a motion to dismiss, the allegations of the complaint are taken as true; and class certification turns on Rule 23’s standards, which do not inquire into the merits of the claim. Bilateral arbitration provides each side with a chance to test the merits of the underlying claim. If the employer loses multiple times, it is likely to settle the remaining cases. If the employees lose multiple times, other employees may decide to give up. But those decisions will be based on an assessment of the merits—not just the burdens of litigating the class action regardless of its merits. That means that employees whose claims prevail are likely to get much more in a settlement than those whose claims fall short, which is just how we’d want a dispute resolution system to operate. The stakes in these cases are substantial—Ortiz stated that approximately 25 million employees are parties to agreements requiring bilateral arbitration. 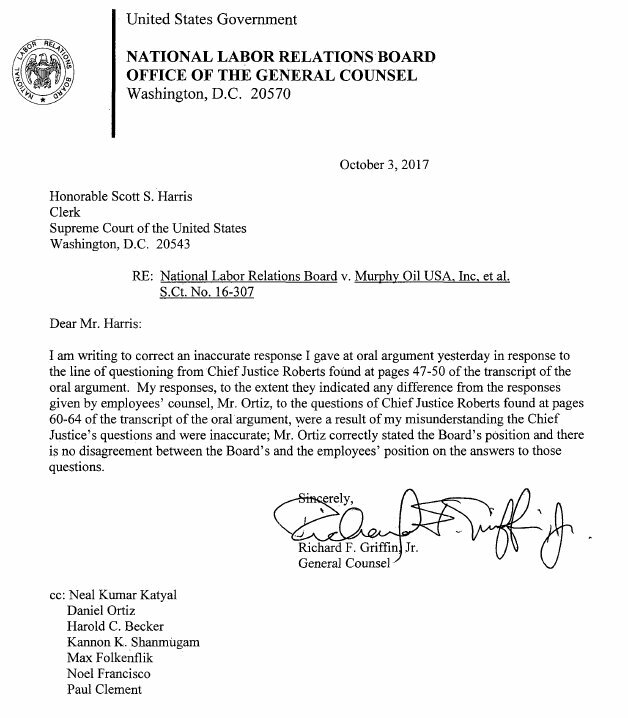 The Chief Justice then reframed that assertion, focusing on its implications for the enforceability of arbitration agreements: “So [a] decision in your favor would invalidate agreements covering 25 million employees.” In our view, the Board’s novel interpretation of the NLRA—one never advanced for most of the Act’s history—should not undermine parties’ long-standing reliance on the FAA’s protection of fair arbitration agreements.